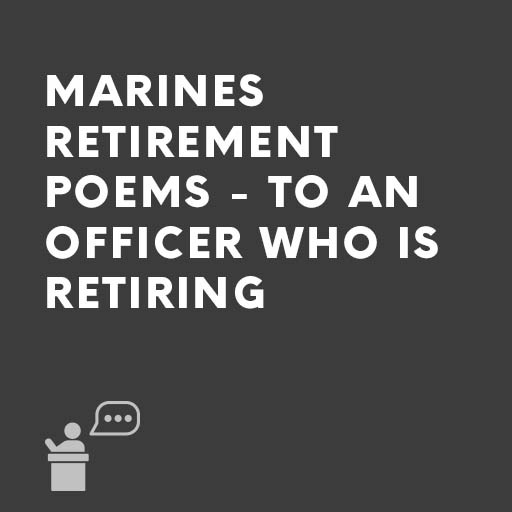 These short poems are ideal for someone who is speaking at the retirement of a marine officer. They speak of duty well done and what the retiree has achieved during his/her service. They end with a light-hearted toast to his/her future. They may be used individually or as a fitting ending to one of the relevant speeches. Order our Ready-to-Go Marines retirement poems – To an Officer who is retiring These short poems are ideal for someone who is speaking at the retirement of a marine officer. They speak of duty well done and what the retiree has achieved during his/her service. They end with a light-hearted toast to his/her future. They may be used individually or as a fitting ending to one of the relevant speeches.